The situation the Ducks are in is reminiscent of the 2006-07 Flyers. Philadelphia performed horribly that year. The signings of Derian Hatcher and Mike Rathje the year before proved horrendous as the two hulking blue liners looked woefully out of place in the quicker post-lockout landscape. These two were a microcosm for the team as a whole. It was a bad team that set a franchise low for both wins and points. Fortunately for the Flyers, they had two young players, Jeff Carter and Mike Richards, on the verge of becoming superstars. They also made a handful of savvy deals over the course of the year that rid themselves of veterans with burdensome contracts. The craziest was trading Alexei Zhitnik to the Thrashers for Brayden Coburn. Steal. They also received a bounty for Peter Forsberg. They received Scottie Upshall, Ryan Parent, a first-round pick and a third-round pick. They turned the first-round pick into Scott Hartnell and recently turned Scottie Upshall into Dan "I was made to play in Philly" Carcillo. This bolstered the team’s youth, which was aided by selecting James van Riemsdyk second overall. The Ducks are arguably in a better position than the Flyers were because their two most promising forwards, Getzlaf and Perry, are further along in their development than both Carter and Richards were for the Flyers. They are already superstars and are both signed to favourable contracts. They also have Bobby Ryan, who seems on the verge of becoming a superstar himself. The Ducks are lucky that they already have a solid core of young players which also includes Ryan Whitney, Joffrey Lupul and Luca Sbisa. The Ducks also have many expiring contracts that will look attractive to contending teams come March. Trading Scott Niedermayer can benefit the Ducks as much as trading Peter Forsberg did for the Flyers. Niedermayer is a superior talent with a bounty of playoff experience. His contract expires after the season, which will only increase his attractiveness to contenders. I’m sure if Niedermayer is available at the deadline there will be inquiries from every playoff-bound team. 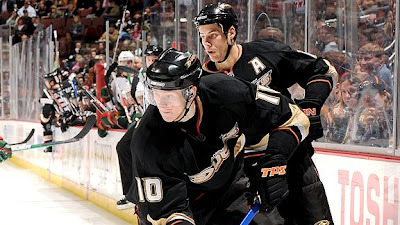 The Ducks also have both Saku Koivu and Teemu Selanne (currently injured until late January) that they can trade to a contender. While these players would not demand the substantial package of picks/prospects that Niedermayer would, they are still very valuable pieces that could help push a contending team over the edge. If the Ducks are able to trade these three players it could help create an influx of young talent into the Anaheim system that can help the Ducks contend in the immediate future. If the Ducks continue to play like the league’s doormats they could receive a lottery pick to go along with any players and picks they receive from trades. While it is presumptuous to suggest this pick can help the Ducks immediately, it is not outlandish to think that within two years this player can contribute to the club (like van Riemsdyk is now). As previously mentioned, the Ducks have a lot of expiring contracts after this season. In fact, they will have approximately $24 million dollars to spend. Certainly, Bobby Ryan and Jonas Hiller will command a large sum of this, but the Ducks will still have a lot of financial flexibility. This will allow them to pursue some of the more attractive free agents on the market to supplement their already impressive core. However, they must not spend as wildly as the Flyers did in the 2007 off-season. That’s the off-season the Flyers chose to spend lavishly on Danny Briere, which is a deal that is hurting the club now. Playing as badly as the Ducks are this season doesn’t indicate they are a bad team. With the right moves this could be a team poised to make deep playoff runs within a few years.